Protect your artwork with resealable bags. Show Bags are perfect for protecting your artwork while travelling. 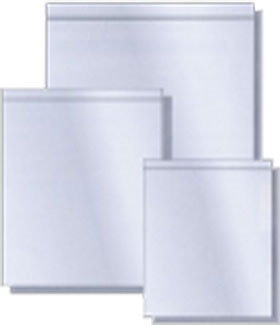 They are designed to fit all the standard picture matting sizes. They are archival quality and will not wrinkle, tear or fog. Show Bags are large enough to fit up to a double mat and foam backing board. The art work, mats and backers slide in easily and are secured with a resealable adhesive on the flap. Bag size indicates the size of the matboard or backing that will easily slide in. For example, an 8x10 matboard (or backing board) requires an 8x10 show bag. Add bags to your matboard and backing to get a complete show kits! Easy to use tools on website; custom sizes available which makes it easy to get exactly what you want. I love it. Will definitely use them again. Excellent product with fast shipping. The mats and frame I ordered were perfect for my use, and they look great. I will definitely use Matboard and More again! I just finished placing my 3rd order for custom sized mat boards. Usually receive in about 3 days and am extremely happy with the quality. Highly recommend. Excellent value for the money - - very professional looking and received them quickly - thank you!